The All Progressives Congress (APC) on Monday reacted to plans by Governor Ayo Fayose to dump the Peoples Democratic Party, PDP. 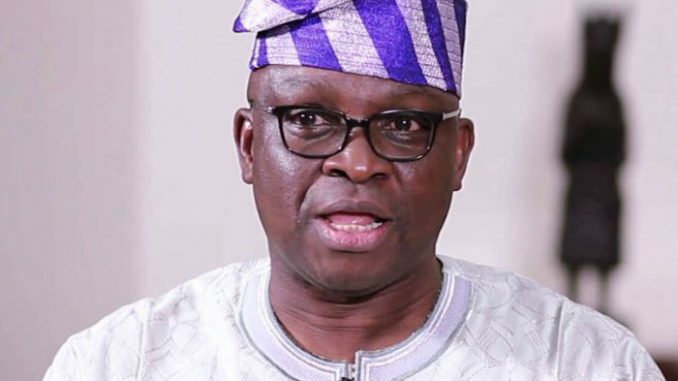 Fayose on Monday threatened to dump PDP, over what he described an attempt by some people to take over the structure of the party and sideline those who have been toiling to keep the party together. Reacting to Fayose’s statement that he may soon quit the PDP, Yekini Nabena, APC’s National Publicity Secretary in a terse statement said the outgoing governor of Ekiti State will be making a grave mistake if he thinks defecting to the ruling party will shield him from prosecution if found guilty. Nabena said Fayose will not escape prosecution even if he joins the party at the expiration of his tenure. The statement read: “Nigerians know that this is a progressive party. No matter what, if found guilty, he will be dealt with according to the dictates of the law. “It is wishful thinking for anyone to believe that joining APC will shield him from prosecution if found guilty. Whether he likes he can join APC, SDP or any other political party, the law will take its course.